While this tutorial can be completed by beginners, it is highly advised to complete 당신의 첫 게임, if you are new to Godot and/or game development and have some experience with making 3D games before going through this tutorial series. Another thing to notice here is how we have everything set up under the ARVROrigin node. The player camera is an ARVRCamera that represents the player's head in the game. The ARVRCamera will be offset by the player's height, and if there is room tracking, then the camera can move around 3D space as well, relative to the ARVROrigin. This is important to note, especially for later when we add teleporting. With that done, let's quickly go over what this script does. Then, we disable V-Sync and set the target FPS to 90 frames per second. Most VR headsets run at 90 Hz, and since the game will display on both the VR headset and the computer's monitor, we want to disable V-Sync and set the target FPS manually, so the computer's monitor does not drag the VR display down to 60 FPS. While perhaps interesting if we were making a VR film, we really want to do more than stand around and look. Currently, we cannot move outside of the room tracking boundaries (assuming your VR headset has room tracking) and we cannot interact with anything! Let's change that! You may have noticed that you have a pair of green and black hands following the controllers. Let's write the code for those controllers, which will allow the player to teleport around the world and allow the player to grab and release RigidBody nodes. This is quite a bit of code to go through, so let's break it down bit by bit. Let's start with the class variables, which are variables outside of any/all functions. prior_controller_position: The controller's previous position. We will use this to calculate the controller's velocity. 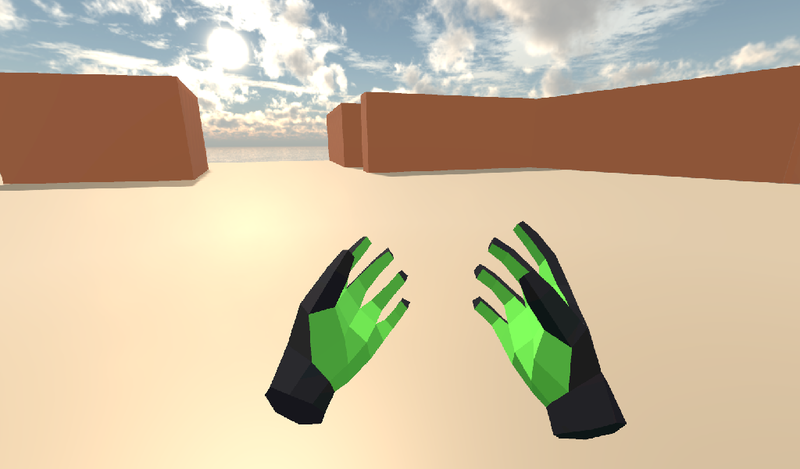 hand_mesh: The hand mesh, used to represent the player's hand when they are not holding anything. Next, let's go through _ready. Now let's go through _physics_process. Next, we check to see if the collision body the Raycast is colliding with is a StaticBody. We do this to ensure the player can only teleport on StaticBody nodes. We then check to see if the Y value returned by the Raycast's get_collision_normal function is more than 0.85, which is mostly pointing straight up. This allows the player only to teleport on fairly flat faces pointing upwards. We then add all of the prior velocity calculations in prior_controller_velocities to controller_velocity. By using the prior calculations, we get a smoother throwing/catching experience, although it is not perfect. We want to get the average of these velocities, as otherwise we'd get crazy high velocity numbers that are not realistic. Next, we calculate the velocity from the position where the controller is currently, from the position the controller was at. We can use this difference in position to help track the controller's velocity. The way we are calculating velocity is not perfect by any means, since it relies on a consistent amount of frames per second. Ideally, we would be able to find the velocity directly from the VR controller, but currently in OpenVR, there is no way to access the controller's velocity. We can get pretty close to the real velocity by comparing positions between frames though, and this will work just fine for this project. Next, we calculate how far the player will go forwards/backwards and right/left by multiplying the VR camera's directional vectors by the combined trackpad/joystick vector. Now, let's look at button_pressed. If rigid_body is not null, meaning we found a RigidBody in the grab Area, we assign held_object to it. Then we store the now held RigidBody's information in held_object_data. We are storing the RigidBody mode, layer, and mask so later, when we drop it, we can reset all those variables back to what they were before we picked up the RigidBody. We then set the held object's RigidBody mode to MODE_STATIC and set the collision layer and mask to 0 so it cannot collide with any other physic bodies. Firstly, we set the held RigidBody's mode, layer, and mask back to what they were when we picked the object up. We then apply an impulse to the held object, using the controller's velocity as the force. Let's look at button_released next. Because we want to teleport the player in their current position to the teleport position, and remember, because of room-scale tracking, their current position can be offset from the origin, we have to figure out that offset so when we teleport, we can remove it so that player's current position is teleported to the teleport position. We set the Y value of the camera_offset to zero because we do not want to account for offsets in the player's height. Finally, let's look at sleep_area_entered and sleep_area_exited. One of the main reasons this can make you feel motion sick is because your vision tells you that you are moving, while your body is not moving. This conflict of signals makes the body feel sick, so let's fix it! Because this script is fairly brief, let's quickly go over what it does. Next, we get the current VR interface, and resize the ColorRect node's size and position so that it covers the entire view in VR. Let's add some special RigidBody nodes we can interact with next. 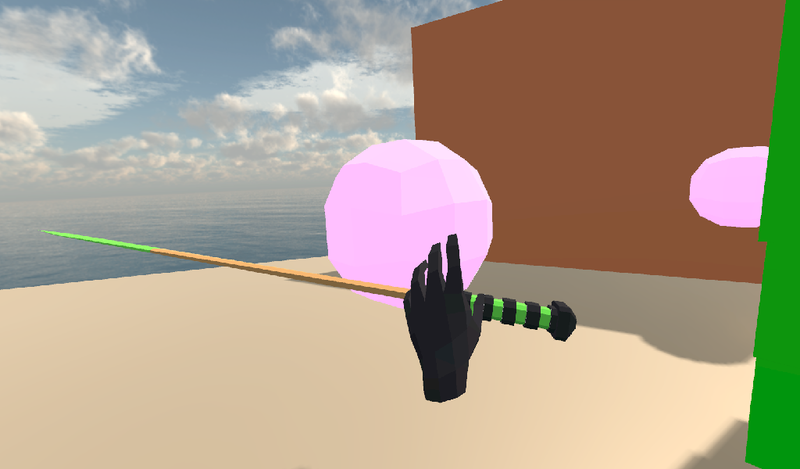 Firstly, let's start by making some targets we will destroy in various ways with various special RigidBody nodes. Let's go over how this script works, starting with the class variables. Next, let's go over _physics_process. Finally, let's go over damage. Then, we remove however much damage the target has taken from the target's health. Firstly, we disable the collision shape and make the whole target mesh invisible. Next, we spawn/instance the RigidBody version of the target, and instance it at this target's position. Now, you may have noticed we are calling a function in Game.gd we have not made yet, so let's fix that! Then, it checks to see whether sphere_ui is not null, and if it is not, then it calls its update_ui function, passing in the amount of spheres left. We'll add the UI code later in this part. Okay, let's add a pistol. Open up Pistol.tscn, which you will find in the Scenes folder. There are a few things to note here. The first thing to note is how everything is rotated. This is to make the pistol rotate correctly when the player grabs it. The other thing to notice is how there is a laser sight mesh, and a flash mesh; both of these do what you'd expect: act as a laser pointer and muzzle flash, respectively. Next, let's look at _physics_process. Now, let's look at interact, which is called when the trigger button on the VR controller is pressed and the pistol is being held. Finally, let's look at picked_up and dropped, which are called when the pistol is picked up and dropped, respectively. Let's add a different type of weapon RigidBody: a shotgun. This is fairly straightforward, as almost everything is the same as the pistol. You may have noticed this is almost exactly the same as the pistol, and indeed it is, so let's only go over what has changed. 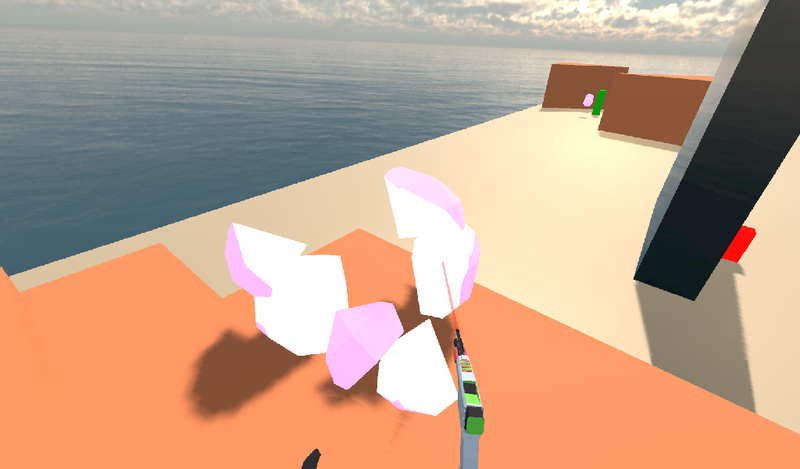 raycasts: The node that holds all of the five Raycast nodes used for the shotgun's firing. While both of those are well and good, let's add something we can throw next — a bomb! Now, let's look at _physics_process. If the bomb has exploded, we add time to explosion_timer. We then check to see if the explosion Particles are done. If they are, we set the explosion Area's monitoring property to false to ensure we do not get any bugs in the debugger, we make the controller drop the bomb if it is holding onto it, we make the grab Raycast visible if the grab mode is RAYCAST, and we free/destroy the bomb using queue_free. Finally, let's look at interact. Finally, let's add a sword so we can slice through things! Let's go over _ready next. Now let's go over body_entered_sword. If the sword is not being held, we use the RigidBody's velocity as the force in apply_impulse, while if the sword is being held, we use the controller's velocity as the force in the impulse. Okay, let's update the UI as the sphere targets are destroyed. Let's go over what this script does. In update_ui, we change the sphere Label's text. If there is at least one sphere remaining, we change the text to show how many spheres are still left in the world. If there are no more spheres remaining, we change the text and congratulate the player. Finally, before we finish this tutorial, let's add a way to reset the game while in VR. Let's go over what this does. In _physics_process, we check to see if enough time has passed to reset. If it has, we reset the box's Transform and then reset the timer.